Do you believe it is effective to focus your marketing efforts on a specific niche? According to an interview Trent Dyrsmid did with Mike Stelzner from Social Media Examiner, niche selection and focus is important to your success. Ready to learn why? In this article, we explore what strategy you can use to determine or change your niche market. Once you’ve chosen your niche, we share what types of content are going to get you the best and fastest results. Why should you focus your marketing on one niche? Every day we are bombarded with all kinds of media that scream out for attention. Our brains have started to filter most of this out. After a while, our brains get bored with consuming the same old information, especially in the B2B world. So now your brain starts looking for more detail pertaining to your personality when trying to decide what new valuable information to use or business products to buy. When you start producing media for a specific niche, it is much easier to make it engaging. Take the time to understand your buyer persona and use examples and media that are designed for that persona. Nowadays it is hard to get prospects to read an email if they don’t feel that there can be a personal benefit for them. Even the look and feel of your website, pictures, and videos has to have a personal and tailor-made feel to it. It brings something that differentiates you from the herd. The hedgehog strategy comes from a Greek story about a fox and a hedgehog. The fox is always trying to catch the hedgehog by working on clever plans and strategies. He never succeeds because his thoughts are scattered, and he can’t focus on one strategy that works. The hedgehog stays alive because he is very good at the one strategy of defending himself with the sharp spikes on his back. Jim Collins further developed the concept in his book, Good to Great. In the image below you will see three intersecting circles. One represents a list of all the things you are passionate about. Another represents a list of things that drives your economic engine (or things you can find a demand in the market for). And the last one, what you feel you can be the best at in the world. 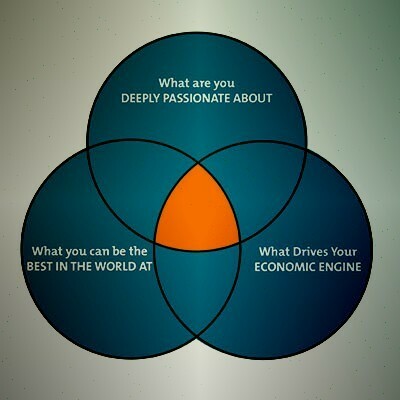 Where these three intersect, you have a sweet spot for creating something great and profitable. Being the best in the world at something is another reason you want to focus on a niche. If you want to claim that you are the best in the world at website design, it will sound a little farfetched. But claiming to be the best in the world at website design for breeders of rare animals is not that hard. Being niche focused makes for strong sales messages and content. Focusing your marketing and sales towards one niche doesn’t mean you can only sell to one niche. You can branch out later. But be the best at one thing before you try switching to something else. Be like the hedgehog, not the fox. To cement your identity in the minds of your customers, they need to see you as the go-to-guy. Quality content will help your prospective customers to find you interesting and inspiring. Add value first, that is what content marketing is. Content marketing isn’t necessarily written or spoken word. It is a way of helping someone to help yourself eventually. And “the help yourself” is almost a complete afterthought. Mike: You got to try to put yourself out of the equation. That is human nature. People love to be focused on. They love to be talked about. They love to be recognized. And if you can figure that out and do that for a lot of people then a lot of great stuff is going to work out. You can use content to serve people. Find a problem people have and present a solution. You can present solutions in many different types of content. Be smart about the content you use. Some types of content are low-risk like writing an article. And you should be producing articles for your website regardless to keep it fresh. Low risk can also mean low return. Why aren’t you adding video to that while you’re at it? People shy away from video, but it is not that hard to produce. And it is so much more effective in creating trust with your audience than just pictures and text. There is a learning curve to producing good video but the sooner you start practicing the sooner you can get comfortable in front of the camera. Heck, start now and do one on your phone camera just for practice! Just start. Here is a guest post on our podcast by Alice Currier from Wistia that shows you exactly how to start producing good video. All types of media are not created equal. Use this to your advantage. Start building momentum by experimenting with all types of content. Trent: And that is one of the things that I love so much about the podcast and being a content creator via interview… For the people who are listening to this, if I had phoned Mike Stelzner up or walked up and said: “Hey Mike can I have a free hour of consulting?” We all know what the answer would have been to that. No. But when you invite someone onto your show regardless really of the size of your audience – obviously you have to make a decent enough first impression I am sure – but if you are listening to this and you are thinking about wanting to create content really strongly consider the interview model because first of all it is really easy to create content, and it is just the most wonderful networking tool on the planet. Creating a podcast is almost like knowing a cheat or a glitch in the game. You will be able to talk easily to people who would have otherwise been unreachable or very difficult to reach. Once you invite them on to your show, you can ask them questions pertaining to problems that you have in your own business. It is almost free consulting like Trent mentioned. But it gets better. If you are selling something that is B2B and a pretty high ticket item, you can easily invite some of your business leads onto your show. Start a podcast. But build it in such a way that you can get free consulting and easy access to your leads. Obviously you have to do your homework and make sure you have something to talk about that your audience will find insightful. If you get this right, it puts you in a great position to determine whether those leads will be good candidates for your product. Trent has an excellent video on how to start a podcast and use it to qualify leads and get customers. Niching down and creating the best possible content for your audience will help a lot of people and it will skyrocket your business to the next level. Use these principles to create a great value added business model. The post Why Niche Selection Will Boost Your Marketing Success appeared first on Inbound Marketing Agency | Strategy and Innovation.